No problems at the border crossing today. The Russian bureaucracy at the border was easy, it just took time to fill in all the immigration papers for me and the bike and then I was welcomed into Russia, border guards much nicer than in Ukraine. I rode on decent roads for most of the morning and then stopped at a lay by to eat some fruit for lunch before riding into Volgograd. As I was there, a lorry driver passed by, stopped the truck and reversed back to where I was. In Russian he asked where I was coming from, and when I explained the best I could that I had come from Barcelona and I was going to Mongolia, he was very surprised and wished me luck. A few minutes later, an old man and his son stopped their old Lada, got off, and said something pointing at the bike. From lots of gestures I understood that he also had a bike in the nearby village he was from, and then he took my address notebook, which I had taken out to call my host in Volgograd, and wrote his name and address there, making gestures indicating that I could sleep at his place if I needed to. I had only been in Russia for a few hours, but the people here were the most helpful and welcoming I had seen! A couple of hours later I rode into Volgograd and into a traffic jam, and when I looked down to my GPS I could not believe my eyes – I was already in the city and the thing said that I still had to ride more than 30km to get to my host’s home. After about an hour of more crazy Russian traffic, I got there and discovered that Volgograd is a massive city – it extends for about 80km along both sides of the river Volga, despite only having 1.5 million inhabitants. I stopped the bike in front of my host’s door and waited for someone to come, and I was more than surprised when his girlfriend turned up accompanied by two other couch surfers that were also staying at the flat… and who were also bikers! One of them, Lex, was from Holland and was riding an old Transalp down south into Georgia and then Turkey, and Martin was from the Czech Republic and was riding his GSA more or less along the same route I was doing, the only difference being that he was doing all the Stans, while I was only doing Kazakhstan. Our host’s girlfriend told me to drop my things and have a shower, and then took us for a walk. 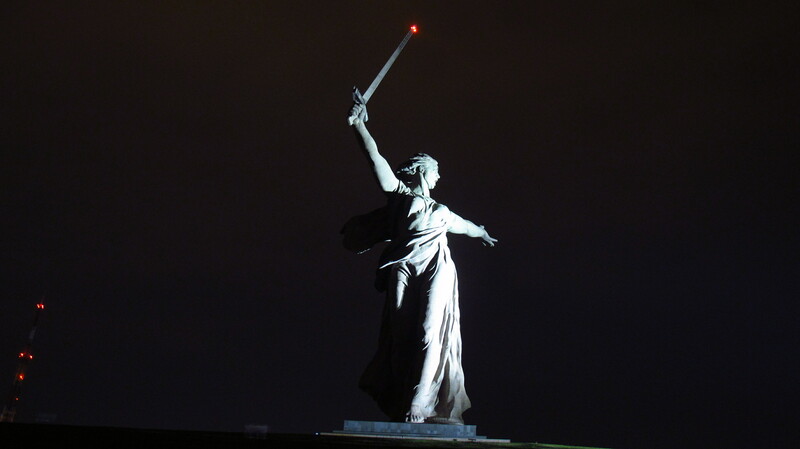 I did not take my phone or anything else, thinking that we would only be away for a while, but we went on a night tour of the city of Volgograd and were not back in the apartment until well past 2 am. I was shattered, but it had been more than worth it, we visited the city’s memorials of the battle of Stalingrad, and they were a magnificent sight at that time of the night, no heat and no other tourists around. Amazing experience. This entry was posted in Stroming The World 2013, Travel and tagged adventure bikers, Volgograd by Kilian. Bookmark the permalink.